THOMAS STEADFAST was born in Bandon, County Cork, Ireland circa 1837 [Descriptive Roll], the son of George and Margaret Steadfast [death rec]. He died in Boston, MA on 25 July 1882, aged 45, from valv. disease of the heart [MA death rec]. He was buried in Evergreen Cemetery in "Deering" (now Portland), Maine. He was first married to ALMIRA J TRAFTON on 11 Oct 1862 in Portland [ME marr rec]. She was born ca 1840, and died in Portland, Maine on 7 Dec 1864, aged 25 yrs, 5 mos [Portl. Deaths, v.6 pg.72; ME death rec]. 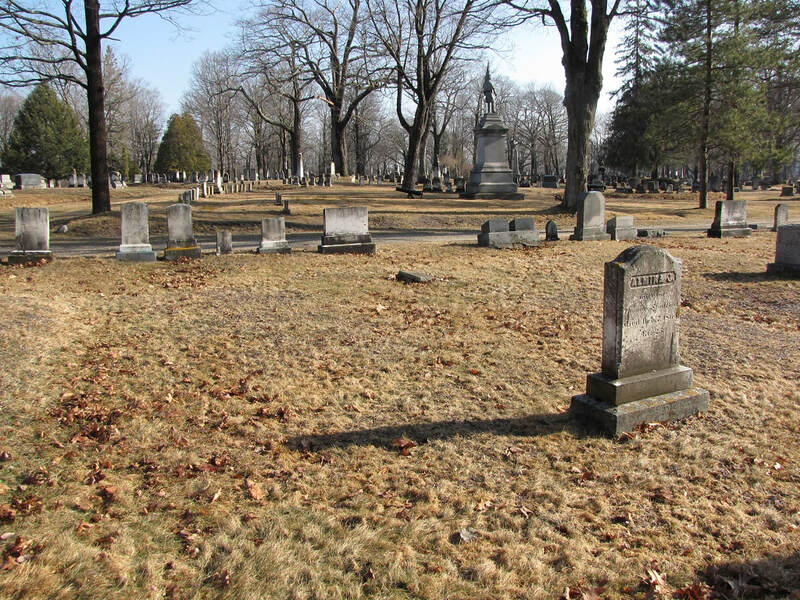 She was buried in Evergreen Cemetery, Portland [Section J, Lot 119] on 12/9/64. Thomas remarried, in Portland on 18 Feb 1866 [ME marr rec], to ELIZA ANN BURBANK. She was born Dec 1837 [1900 census] in North Conway, NH [2nd marr rec], the daughter of Thomas and Mary Burbank [2nd marr rec; father listed as Stephen on death rec]; she died in Boston on 22 Aug 1919, aged 72 [MA vr], and was buried in Cedar Grove Cemetery. She had remarried on 6 Sept 1883 in Boston to William H Rowell, son of William H.H. and Sarah Rowell [MA vr]. Marriage rec to Thomas lists her as "Miss", though it seems she had previously been married to a Jacob Harriman (no marriage or divorce rec yet found). Thomas Steadfast (or Stedfast) arrived in New York from Ireland on 8 Apr 1843, and was "of Biddeford, Maine" in 1858, when he was naturalized on the 19th of April [York Cty Sup. Jud Crt, v.15, pg.539]. He then moved to Portland, where he was listed as a hostler in the 1860 census. He was a barber by 1862, when he enlisted from Portland as a substitute for David Walker of Limington, and served with the 27th Maine. He afterwards moved to Boston, MA in 1870 with his family, where they remained following his death. i. (his step-dau, perhaps adopted) HARRIET ELIZA (or ELIZABETH) HARRIMAN [later STEADFAST], b. 4 Jul 1857 [grave] in Gorham, NH [MA marr rec; death rec], the dau of Eliza Ann and her 1st husb Jacob A Harriman; d. 20 May 1888 in Stoddard, NH [NH death rec]. She married, as his 2nd wife, OLIVER G TAYLOR (a 27th Maine veteran), on 9 Nov 1871 in Boston [MA marr rec]. They are buried in the Goodwin Cemetery, Alfred, Maine. ii. (adopted) CHARLES H. STEADFAST, b. ca Apr 23 1866; d. 26 Aug 1866 in Portland, from consumption, aged 4 mos, 3 das. Bur in Evergreen Cem (Steadfast plot). Death record says "son of Thomas", though newspaper account [Daily Eastern Argus, 8/28/1866] says he was the adopted son of Thomas and Eliza. iii. IRVIN THOMAS STEADFAST, b. 19 Jul 1866 in Portland [Portland Births v.8 pg.197]; d. ; Married 26 Apr 1892 in Boston [MA vr v.426 pg.117] to JENNIE E COLEMAN. The dau of Henry and Marcia Coleman, she was born in Boston. "Thomas I" lived in Boston, and was an insurance adjuster and city fire inspector. 1. Elmer Henry Steadfast, b. in Dorchester, MA on 18 Apr 1894 [MA vr]; d. 7 Jul 1983 in Needham, MA [MA Death Index]. Marr to Gladys E [1920 Medford, MA census]. 1860 Gorham, Coos, NH census (pg 114): hh 905/864; Eliza Ann, 23, with Jacob A Harriman, 31, Carrie A, 7 and Harriet E, 4 [note: This Carrie A looks like the Clara A who later married a Cutter, and a Walter Buchanon]. I don't see her moving to Maine as her mother and sister did, nor using the Steadfast surname.